Doctor Who (Classic): "An Unearthly Child"
"An Unearthly Child" / "An Unearthly Child" / "An Unearthly Child" / "An Unearthly Child"
It's November 23, 1963. The future, for the next few years, is going to be more chaotic and world-expanding than most people can imagine, although some sense of that is surely dawning, as people watch news coverage of John F. Kennedy's assassination in stunned disbelief; it just happened yesterday. (And over on Mad Men, Roger Sterling's daughter's wedding has just been ruined by this news.) Amid this flurry, Doctor Who began its marathon run through time and space, eventually becoming the longest-running science-fiction series in TV history. Over the course of these columns, we'll explore a wide range of the show's history covering the first eight incarnations of the mysterious Time Lord. It's a lot to take in, and if you need an overview of all this before we start, read the Primer I wrote last year and then meet us back here. OK, everyone ready? We're going to start, naturally enough, at the beginning. What we're about to watch is a four-part serial, originally broadcast in 25-minute segments over the course of a month—the format that the show would follow for almost the entirety of its original run. It's really two completely separate stories, with the first episode establishing the overall premise and introducing the four main characters and their timeship, the TARDIS, and the next three (often referred to separately under the title "100,000 B.C.") constituting the travelers' first proper adventure. Along with the next story, "The Daleks," (which I'll cover later on), pretty much everything that will define the series is established here. The first episode is, I think, brilliantly done; the next three together could be about a half-hour shorter but get the job done. I'll spend a little more time on the first episode, which does most of the heavy lifting here. It seems pretty clear that Russell T. Davies studied the structure of "An Unearthly Child" closely when he was writing "Rose," the episode that kicked off the current relaunch of Doctor Who. Both start by focusing on the companions (schoolteachers Ian Chesterton and Barbara Wright, in this case) and particularly stressing their ordinary, everyday lives. The science-fictional elements ramp up slowly, easing the audience from normalcy into the wonders and terrors to come, with the Doctor himself as the central mystery. As with Rose Tyler, Ian and Barbara are slowly drawn in to a web spun from their own curiosity. Unlike Rose, their journey isn't voluntary. Then it's on to Coal Hill School, where Ian and Barbara are discussing the puzzling behavior of their 15-year-old student Susan Foreman. Susan is friendly and bright, but something about her is more than a little bit off—she's hiding something. For one thing, she seems to be a genius: "She lets her knowledge out a little bit at a time, so as not to embarrass me," says Ian ruefully. But something isn't normal about her home life—she balks at Barbara's offer of private tutoring because her grandfather "doesn't like strangers." And her address? It's not a house, it's that junkyard. So where does she really live? And why is she lying? Concerned, the two decide to find out what's wrong. First, though, we meet Susan, who is not, it turns out, completely unearthly: She's rocking out to pop music on the radio like any typical teenager. On the pretext of lending her a book on the French Revolution, the teachers offer her a ride home, which she declines with the vaguely unsettling line "I like walking through the dark; it's mysterious." After Ian and Barbara leave (to secretly stake out 76 Totters Lane), Susan flips open the history textbook—and immediately exclaims she's found an error. Curiouser and curiouser. In Ian's car, the teachers admit that they're motivated as much by the mystery as concern over Susan's welfare. Why does she insist that her inability to make the right change for a pound is because she's used to a currency system that "hasn't happened yet?" Why does she claim she can't solve Ian's geometry questions without resorting to five-dimensional math? Ian and Barbara follow Susan inside the junkyard, only to discover she's gone, and there are no other exits. There's only the police box with its mysterious hum—and Ian senses something more when he touches it: "It's alive!" They're interrupted by the arrival of Susan's grandfather, a sinister old man dressed in black who evades their questions and is relieved when he deduces that they're not from the police. Having heard Susan's voice from inside the box, they assume she's being held against her will. Watch the impish look in Hartnell's eye as they try to unlock the door. He's gloating to himself that they're not smart enough to get past him but also intrigued by the idea that they will, and won't that just blow their tiny minds? It seems not a little malicious; I can see this character getting along quite well with Montgomery Burns. When Ian and Barbara at last push past him and barge inside, they leave the real world behind. With the doors firmly closed, the Doctor freely explains everything: He and Susan are time travelers, exiled from their homeworld, and the junked old police box is really their ship. He can reveal all that because, like the many melodrama-loving villains he'll later encounter, he's just about to do something dastardly. He's going to kidnap Susan's teachers to keep them from revealing what they've learned—a decision certainly made the moment they entered the TARDIS and probably sooner. But is it only for that reason? After all, he plans to leave anyway. Who cares what Ian and Barbara might say, and what proof would they have? I think there's something more complex at work underneath—when he sees that they're curious to a fault, he recognizes kindred spirits, and although he's a difficult old geezer, he's also lonely and restless to explore. He's been hiding for months in 1963 London to give Susan some stability and to stay out of sight from whoever is hunting him, but his essential nature gets the best of him. Susan begs him to let her stay, and he seems to relent—but it's just a trick to give him time to dematerialize the TARDIS, and off we go into the wild blue yonder. Or in this case the wild, psychedelically distorted yonder—the LSD aspect of the counterculture was just beginning to enter popular consciousness in 1963, and the swirling time-travel effect (also used over the opening credits) seems like a prescient early example. And just what is the TARDIS? A product of advanced science, obviously, but also clearly descended from the wardrobe that leads to Narnia and the tornado to Oz—gateways to new worlds. Ian's suggestion that it's alive is explored a little further in the upcoming episode "The Edge of Destruction" and a lot further much later in this year's Neil Gaiman-penned "The Doctor's Wife." The Doctor posits another explanation in the metaphor he uses to explain how it can be bigger on the inside—it's television itself, a little box with a door that shows you the whole world and everything beyond. So Alice has fallen down the rabbit hole, but will she land in Wonderland? Apparently not: The TARDIS shudders to a landing in a desolate wasteland, and a menacing shadow looms as the ending credits roll. This is history's dark side. Picking up the story in the second episode, "The Cave of Skulls," there's barely enough time for the wonder of the time journey to settle in before the stark reality emerges. They've landed in a brutal and dangerous time: the Ice Age. Only moments after they leave the TARDIS, the Doctor is clubbed on the head by a caveman, and all four wind up imprisoned by the desperate, violent, and (it's strongly implied) cannibalistic Paleolithic clan. The tribe itself is on the brink of survival: The leader, also the only person who knew how to make fire, is dead. Rivals Za and Kal vie to take his place, both claiming that the fire orb in the sky favors them, both lying, and both sounding weirdly like Cro-Magnon forerunners of modern political advertising. Za knows fire has something to do with sticks but is publicly humiliated when, in one of those moments where it's hard to believe someone wasn't trying to sneak a joke past the censor, his cave-girlfriend Hur urges him on while he frantically, desperately rubs a thigh bone with some dry grass, but just can't get the thing to spark. The four travelers catch a break when the tribe's old woman, who is terrified of fire, lets them go, leaving Za and Hur to chase them down. On the way, Za is attacked by some off-screen beast (a convincing sabertooth cat wasn't in the budget in the early '60s), leading the Doctor and the others to square off about whether they should just leave him to die. And not just leave him—when it seems he's lost the argument, the Doctor is ready to kill Za himself before Ian backs him down. Kal is the villain of the piece, but it's interesting that the morals presented in this kids' show are quite murky. Za is far from an obvious good guy. Kal is treacherously willing to kill the old woman and then frame Za for the murder and the TARDIS crew's escape—and pays the price, driven out of the tribe to die in the cold wastes after the Doctor proves his guilt. (It's not hard: He's so dumb he doesn't realize that smashing a skull leaves a bloodstain on the rock, despite the fact that the entire cave is filled with shattered skulls he and his people made.) But after Ian delivers the moral lesson that "Kal is not stronger than the whole tribe," after which another program might just have run the credits, Za imprisons them all again, even after Ian tries to bargain for release by giving them fire. (And also kills Kal in a surprisingly vicious fight scene.) In the end, the travelers have to make their own escape, arranging four skulls on top of torches to make the cavemen think they've died. Ian and Barbara are quickly established as normal, friendly, relatable characters that the audience can identify with, who will react the way we would. Susan's alienness will always keep her a bit at arm's length, but it also grounds her emotionally in a way we can understand, because every teenager feels lost and out of place, if not chronologically unmoored. Although they're authority figures, Ian and Barbara aren't stuffy—Ian knows his pop-music trivia, even if he's not its biggest fan. It's also notable that Ian and Barbara are, respectively, a science teacher and a history teacher—the show had been conceived as an educational program with enough adventure to keep the kids interested, and Ian and Barbara would be Susan's tutors (and the audience's by proxy). The final program took a less didactic approach, but you can still see it in the skeleton of the plot. My recollection from previous viewings of "An Unearthly Child" left me with a bad impression of Ian, whom I remembered as being pushy and macho, but unless he grows worse later, I was wrong; on this viewing, he gives the Doctor a run for his money as the series' real lead, resourceful and capable of some quick and subtle persuasion. Notice how, when he's making the fire, he tells Za that the Doctor is the leader of the TARDIS "tribe," not him? That's partly a genuine gesture of respect for the old man, but it's also a lead-in to Ian's attempt to convince Za to release them if Ian teaches everyone the secret. It's not his fault it doesn't work. Barbara is quieter, but note that she's no dummy, understanding how the TARDIS works before Ian does. Susan is still something of a cipher; I haven't seen a lot of the later Hartnell shows in a very long time, and I'm intrigued to discover if and how much the show delivers on the promise of her character. The most intriguing character, unsurprisingly, is the Doctor, partly because he's still shadowy and mysterious but also because he's so different than the Doctor he will become (any of them). The Doctor will always be something of a trickster figure, but at this point, there's a real sense that he hasn't decided, or hasn't learned yet, whether he's a hero or a villain. He's sneaky and untrustworthy but shows kindness and concern for his granddaughter, and there's genuine anguish in his voice when he talks about being alone and friendless and never able to go home. He's running from something that terrifies him, and given his suspicious behavior, you're forced to wonder if he's not a criminal fleeing just and proper arrest. And here's something significant: His first major decision here, to kidnap and flee, makes everything worse. This isn't a guy with a grand plan who can wave his sonic screwdriver like a magic wand—this is a guy who recklessly and foolishly courts trouble to satisfy his ego and curiosity and often gets in over his head. 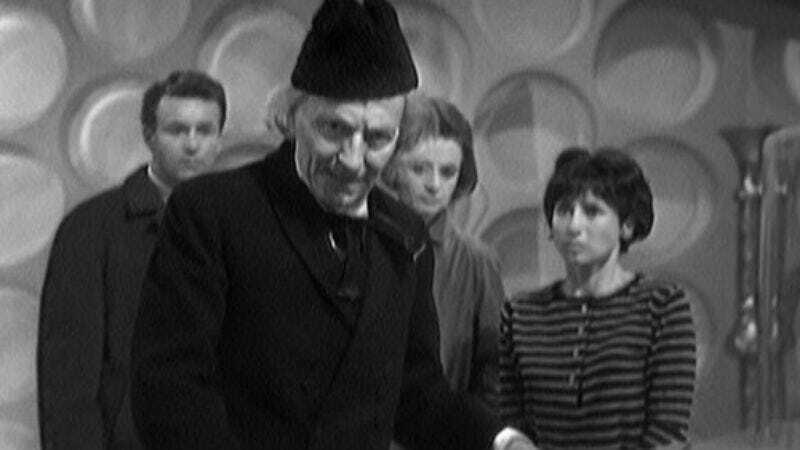 Although the title of the debut episode is clearly meant to be a reference only to Susan, in the context of what we now think of as the Doctor's history, he himself is also an unearthly child. It's a sharp, even shocking contrast with his future replacements, although Hartnell's cantankerousness and imperiousness would be character traits that would resurface repeatedly. But this is also, especially here in his first appearance, a person who's very far away from the Oncoming Storm concept, the wizard of time and space who has the power to wipe out entire civilizations and who can singlehandedly fix any problem, even the end of the universe. (A concept I wish would get toned down a little, I have to admit.) He's crafty, but not as crafty as he thinks he is. He's scared, naive, petulant, and prone to making some rash and unwise decisions—kidnapping Ian and Barbara, considering Za's cold-blooded murder, and, surely, stealing the TARDIS in the first place. It's worth noting that a very early conception of the character was that the Doctor would reveal himself to be a kind of chrono-terrorist who wanted to destroy his planet's future by meddling in the past. Although the idea was shot down by series creator Sydney Newman, there are still echoes of that villainy in the Doctor here. Clearly, he and Susan have done some traveling before settling in at the junkyard on Totters Lane—there's a reference to the French Revolution—but probably not that much. He seems to be an uneasy traveler, not comfortable or experienced with encountering new people or new cultures. We get only vague hints as to why he left his still-unnamed home planet or what kind of life he led there before fleeing, but I like to imagine—and this is pure speculation on my part—that the Hartnell Doctor grew old in a quiet, sheltered life spent more among dusty old books than dealing with people, perhaps as an academic or a librarian. What about his family? Was Susan really his biological granddaughter, and did he therefore have a wife and children he left behind? I don't know, and I think I'd like that question to stay unresolved. But I think that his decision to steal the TARDIS was a monumental break from his previous routine, made with uncharacteristically reckless haste and unexpected even to himself. Why he did it, I don't know, and I'm pretty sure I don't want to—there should be a mystery to the Doctor's beginnings. This show isn't really about beginnings, or endings for that matter, but about the journey. I can't praise that eerie and mysterious theme music, written by Ron Grainer and brilliantly embellished on and brought to life by Delia Derbyshire, highly enough. One of my favorite pieces of music ever, and it encapsulates the show so well. It even sounds like space! Doctor Who was quite progressive for its time, which owed a lot to its first showrunner, Verity Lambert, and director Waris Hussein, but there are moments that remind you how casually racist things often were in 1963—like the Doctor's appalling reference to "Red Indians" and their "savage minds." June 12: "Tomb of the Cybermen"
June 19: "Spearhead From Space"
After that we'll range around a bit, but I haven't locked down an exact schedule. I will almost certainly return to Hartnell for "The Daleks" first, though—I'll keep you posted. Where can you watch online? Some, but not nearly all, of the serials are available on Netflix—nearly everything is available on disc, but far less on streaming, and those come and go. 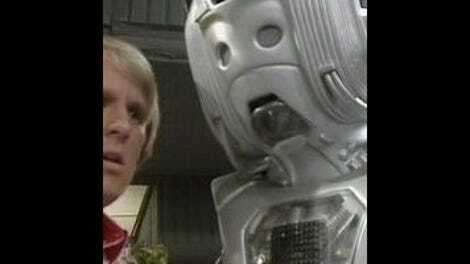 "Tomb of the Cybermen" was available a few months ago, but not now. "Spearhead From Space" is there, though. Conversely, nearly everything can be found on YouTube, but I don't think any of those videos are BBC-approved, so there's no guarantee they won't be yanked down. Next week: The Doctor (played by Patrick Troughton this time) faces down one of his greatest recurring villains in "Tomb Of The Cybermen."